1. Heat the oil in a large saucepan. Cook the onion and garlic for 5 minutes until softened. Add the tomatoes and cook for 2-3 minutes until pulpy. 2. Add the butternut and sweet potato, stock and chilli, if using. Bring to the boil and simmer for 5 minutes. 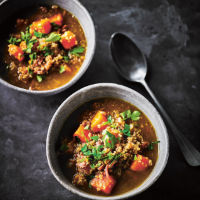 Stir in the quinoa and ham hock and cook gently for 15 minutes until the vegetables and quinoa are tender. 3. Ladle into bowls, scatter over the parsley and serve. Cook’s tipFor a vegetarian version, use vegetable stock and swap the ham for some canned chickpeas.